Sanyo is well known for manufacturing households electrical appliances such as microwave, cooker, stove and of course, Sanyo aircon Singapore. It is one of the popular air-conditioner choice, where until now, you are still able to spot Sanyo Aircon in most household and commercial buildings. It is widely installed across regions in Singapore since it is popular for its design and quality. If you are looking for quality Sanyo aircon servicing Singapore, you are in the right place. With our experienced technicians, we are able to provide quality aircon servicing for your Sanyo air-conditioner. Sanyo air-conditioning servicing is very important in up keeping the condition and performance of your system. By having regular aircon servicing for your Sanyo aircon Singapore, it has many benefits such as improving air quality, air flow, cooling efficiency which will ensure a clean, healthy and strong cold air in your home or office. In addition, by maintaining your air-conditioning system properly can prevent breakdown issues and extend the lifespan of your system. As one of the leading Sanyo aircon servicing company in Singapore, we ensure that all of your air-conditioning units are serviced and maintained in good hands by our experienced and qualified aircon technicians. Regardless of the brands, models or types of air-conditioner, we are able to provide quality aircon servicing, chemical wash, repair, maintenance and installation. We believe that we are able to meet your air-conditioning needs in Singapore for your home or office. Feel free to contact us today to book a servicing appointment. If you have already made the first step in selecting and installing your Sanyo and I am sure that you will want it to last as long as it could to make your investment in your air-conditioning system worthwhile. Air-conditioner works the same as other machinery or cars where regular servicing and maintenance is crucial in keeping your aircon in good working condition and performance level. Furthermore, Singapore is well-known for its hot and stuffy weather which is why air-conditioner are widely installed and used in Singapore. With the high usage of Sanyo air-conditioner in Singapore, aircon servicing is even more important to ensure that the air-conditioning system is operating smoothly and prevent any issues from happening. I am sure you do not want your Sanyo air-conditioning to break down on a hot weather. If you are looking for professional air-conditioning servicing for your Sanyo system, give us a call anytime. Regardless of what aircon problems you are facing, we are able to rectify and repair your aircon problems efficiently. It is not uncommon when your Sanyo air-conditioner starts surfacing problems such as aircon not working, aircon not cold, aircon blowing warm air and many more. However, you no longer need to worry if you face such problems as with our qualified and trained aircon repair technicians, we are able to repair and fix your aircon problems efficiently. It is important to engage a professional aircon repair company to fix your Sanyo air-conditioning. A well-trained and experienced technicians are equipped with technical knowledge which will ensure that the fault is diagnosed accurately and repaired professionally which will regain the functionality of your air-conditioning system. Contact us to book a Sanyo aircon repair Singapore appointment today. Other than general servicing and repair services, Wei Wei Aircon also provide quality Sanyo aircon chemical wash in Singapore. We have years of experience in the air-conditioning industry where our technicians are equipped with the necessary knowledge and experience in performing chemical wash. Some of you may feel that aircon chemical washing is not necessary as long as your units is working. However, there are actually many reasons on why you should opt for Sanyo aircon chemical cleaning. Aircon chemical cleaning actually has many benefits such as improve airflow, improve cooling efficiency, eliminate dirt, dust, debris and other harmful substances, clean and healthy air and many more. You may feel that your air-conditioning units are working fine, however, your units may already have dirt, dust, debris, bacteria and mold accumulated which is extremely unhealthy for our body. Furthermore, if your air-conditioner does not have regular servicing or cleaning, the dirt and dust that are build-up will cause potential issues to your air-conditioning system. This will affect the condition and performance of your units and cause malfunction issues such as system breakdowns. Among the aircon services offered in Singapore, chemical wash is the top most effective aircon services where it is able to thoroughly wash out all the dirt, debris, dust, bacteria and other harmful substances. If you want to book an aircon chemical cleaning appointment with us, feel free to contact our friendly staff today. Other than aircon servicing Singapore, repair and chemical wash, we also provide quality Sanyo aircon maintenance in Singapore. Our aircon technicians are well-trained in most aircon brands, models and types of air-conditioner in Singapore, including Sanyo aircon repair and maintenance. Thus, with our qualified and experienced technicians, we are confident in providing top-notch Sanyo aircon maintenance and servicing for your air-conditioning system. There are many benefits from engaging our Sanyo air-conditioning maintenance services. Some benefits are such as improving air quality, operating efficiency, performance and coolness of the system. By having periodic maintenance, it will keep your air-conditioning system in tip top condition and reduce the possibility of major breakdowns in the future. This will help you to save on the hefty repair cost in the future and also extend the lifespan of your system, allowing you to benefit the most from your air-conditioner. Installation of Sanyo aircon requires expertise and experience to install the air-conditioning units properly. If you were to engage a poor installer to install your Sanyo air-conditioner, you may end up facing aircon problems such as aircon leaking, aircon not cold and other problems. Hence, if you are looking aircon installation in Singapore, make sure to look for a certified and reliable Sanyo air-conditioning installation company in Singapore. At Wei Wei Aircon, we specialise in aircon servicing, repair, maintenance, chemical wash and installation for different brands, models and types of air-conditioner in Singapore. Hence, we strive to become your one stop aircon company in Singapore. We provide aircon installation for different air-conditioning brands and models, including Sanyo aircon. Thus, if you are looking for aircon installation, do not hesitate and contact us today, our friendly staff will advise you on your air-conditioning needs for your home or office. 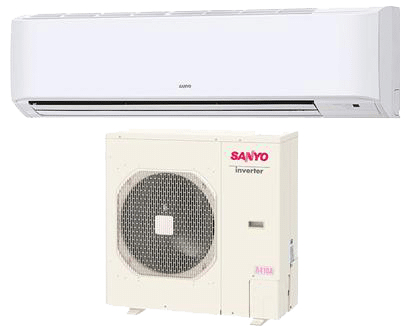 The Sanyo air-conditioner is well-known for its quiet and simple design, it is one of the suitable air-conditioning system for your home or office in Singapore. If you are currently using Sanyo aircon in your home or office, you should have been already amazed by its quiet operation performance and its auto cleaning features. The quiet operation performance will ensure that the noise disturbance from your air-conditioner is minimised so that you are able to relax and sleep without much disturbance from your units. Despite such features and capabilities, Sanyo aircon servicing is still essential in maintaining the condition and performance of your air-conditioning units. Regular maintenance will keep your Sanyo air-conditioning system clean and ensure that they are working smoothly. Other than that, regular aircon maintenance will reduce the chances of your units facing malfunction problems. In this long run, the benefits and savings from future hefty repair cost will definitely outweigh the little cost of maintenance. Do you face aircon problems with your air-conditioner units in Singapore? There are many different aircon problems that you may encounter. For examples, Sanyo aircon water leaking, not working, not cold, refrigerant leak, smelly air and many more. The above mentioned are the common problems faced by local households. There are a number of problems that your air-conditioning system can encounter during its lifespan. All these problems could eventually cause health issues to you and your family. For example, the emitting of foul smell from your Sanyo units could be due to the growth of bacteria and mold in your air-conditioning units. These harmful substances from the mold and bacteria will be blown out to the room or house and eventually breathed in by you and your family members. This will cause or worsen your health in the long run, especially for children or elderly with an existing health condition such as skin problems or asthma. Other than health issues, it can cause you additional money when you pay for the hefty repair cost of your system. A malfunctioned Sanyo air-conditioner not only will cost you additional repair cost, but also cause frustration and inconvenience to you and your family. Therefore, regular Sanyo aircon servicing and maintenance is essential in preventing the above problems and keep your Sanyo system in good working condition. With our years of experience in the air-conditioning industry, we are confident in servicing and repairing your Sanyo aircon Singapore. If your air-conditioner is facing problems, it could be due to several problems. However, you do not have to worry as our qualified technicians are able to resolve and repair your units and retain the functionality so that you can continue enjoying the cooling air. If you are looking for quality aircon servicing Singapore, repair, chemical wash, maintenance or installation services, feel free to contact our friendly staff today.